MSKPU Open Days are behind us! MSKPU > Aktualności > MSKPU Open Days are behind us! We opened our doors again! On the sixteenth and seventeenth of May, MSKPU open days were held. People interested in studying could take part in free workshops on making jeans, creating linocuts, journal drawing, as well as lectures on fashion history. MSKPU’s Open Days this year have been uniquely combined with Levi’s 501 DAY Lab, which were also led by our lecturers along with people who gave a helping hand. In addition, the day before Levi’s 501 DAY Lab, special dedicated presentations took place at our school, which helped in preparation for the customization of jeans. Due to workshops with a quick, manual print with a costume designer Marta Dąbrowska-Okrasko, people interested in learning had the opportunity to acquire knowledge on how to make prints on the fabric in the form of a convex print, which can be easily done at home. 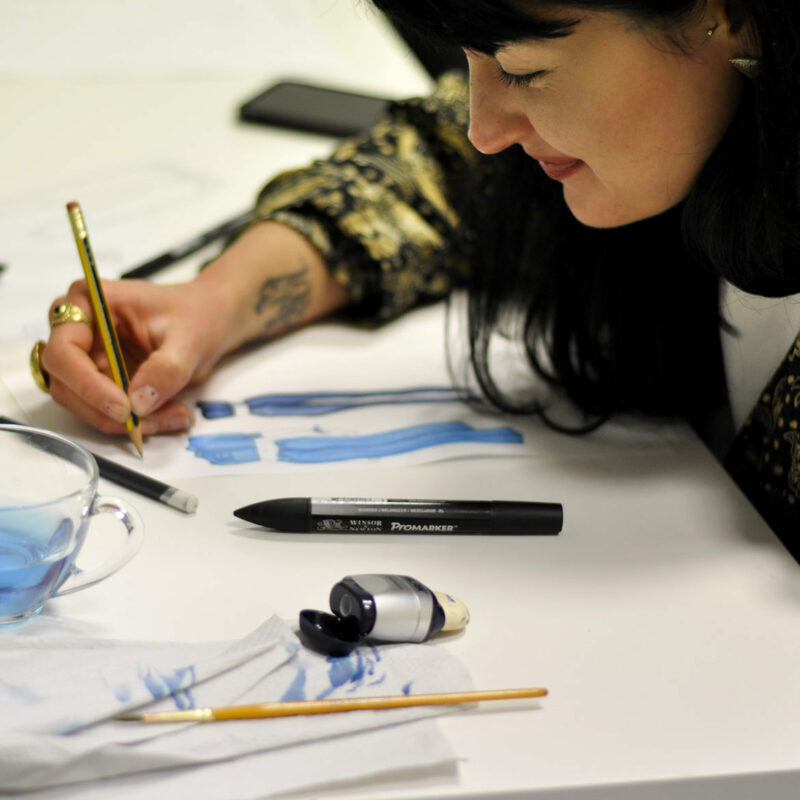 One could also take part in workshops on drawing denim fabrics with Mrs. Sylwia Lewandowska. Student candidates created different jeans textures using several tools and techniques. MSKPU provided special paper for water techniques with ready-made stencils. Mrs. Weronika Pietras, who teaches fashion design at MSKPU gave a very interesting lecture on the history of jeans, while Mrs. Magdalena Floryszczyk presented the techniques of customizing jeans and the most interesting inspirations taken from both the street and the world catwalks. Participation in the presentation prepared the audiance for Levi’s 501 DAY Lab workshops, during which everyone could personalize their jeans. Both Mrs. Floryszczyk and Mrs. Helena Wargin who teaches clothing construction at MSKPU kept an eye out for the above. You can see the report from the workshops below. The film was created by our student Agnieszka Dratwa.